Super Susie's Bucket List: Super Susie "Kicks the Bucket"
Super Susie "Kicks the Bucket"
Last nite @ 6:15pm, Super Susie/Mom/Grandy's indomitable Spirit left her body. I arrived on Sunday morning (Valentines Day & her Grandson Paul's birthday)... She was surrounded by a continual stream of family & friends visiting. She was tired. Being an awesome athlete herself, we sat back enjoyed the Olympics & chatted the day away. She dozed in/out... When she'd wake & see us, she'd beem & say "O! Look who's here!" Then she looked deep into the new visitors eyes w/ a look that pierced your soul & say... "I'm going to miss you so much!" "I had a dream about you... I'm going to miss you so! Thank you for being so SPECIAL for me!" At about 4p, she said "GoodBye" to her son Mike & myself. She closed her eyes & became very silent. Believing this was "it"... We held her hand & waited for her passing. The abyss of time was unending... We waited n waited (it seemed like an eternity)... 30 minutes later Mom opens her eyes, & chides us, "you aren't gone yet?? I thought I told you guys Good Bye"! We responded, "US!?!? We thought YOU were the one leaving!!" We all laughed as Mike & I walked out her door... Knowing she was just where she wanted to be, doing what she needed to do. The next day/yesterday was different... Mom was restless, she told her first visitor, youngest son, Tom, "I'm sooooo tired!". God sent messages to friends, family, & her fans who met her thru CBS' Early show, National Inquirer, Local TV & Journals... Emails, phone calls, drop in visitors coming in from all around... All were received & appreciated as the continual influx of affirmation, adoration & prayer filled Mom's Room. There was nothing but love in the air! The message was clear, "Susie, you have played a great game & have taught us well... You can't get any better in this game of Life... it is time to "move to the next level". But how could she?? there was so much love in the room & everyone was saying such nice things about her... She didn't want to leave!! Who would??? At about 5:30p; there were only Weadocks in the room. 3 of Mom's children & 2 of her grandchildren. Tom had just returned from his visit to Sacred Heart Church & meeting w/ the parish priest & the officiating priest. He came back w/ the Plan. "O! Good! everybody's here!" Tom said. "We can review Mom's Funeral Service!" I then turned to Mom & said, "Mom, we are planning your Last Bucket! Unfortunately this the one you are not here for. So, you have to Move On! We can't do this Bucket if you're around!" Everyone agreed & encouraged her to 'Get UP THERE' where she'd have the best view!! We all looked at each other... I just laughed! Mom had realized that she really DIDN'T need to be around for this family discussion... She just wanted her friends & family to love her & love each other! She could care less about music or venue... Those battles could be officiated by someone else! Through the Buckets and YOU, Mom learned that she could finally close her eyes, hold her breath.... And TRUST. The constant "Giver" to the end... Mom donated her physical body to science. So there will be no Wake & we are giving time for the service Mass so everyone who wants to attend can make arrangements. The Catholic Memorial Mass will be held on Wednesday February 24, 2010 at 11:00 a.m. at The Shrine of the Sacred Heart in Mount Washington, Maryland. There will be a reception at L'Hirondelle Club 7611 Club Rd, Ruxton Md 21204 immediately following the service. Please don't send flowers... Instead donate to the Christopher Reeves Foundation for Spinal Chord Injury or to Wheelchairs for the World (sponsored by Joni Ericcson Tata). Thank you for being you for all of US! I just want to express my deepest condolences. I hope I have included all emails of those who I connected with at the skydiving event. I just picked off the ones that had a "Weadock" in the emails Ouise has been sending. Anyway, I made the announcement to those following Susie's story through me, and every time I get an answer: "I'm so sorry". They are swiftly corrected. I'll assume you know what that means. I've never met or heard of anyone passing (and there have been many) who went out that way - so gracefully, she just owned it! I realize I may have come in to the picture in the bottom of the 9th., and I wasn't sure how that might be received by everyone, but I'm damn happy I did. Life really comes down to a few key experiences and this was one of them and it will stay in the front of my mind for ever. I hadn't communicated with Susie until I heard about her diagnosis from Louise, then spoke with Paul and Shannon a bit more about it as they filled me in on the strength they were witnessing, followed by the hang gliding video I saw on the blog. I've been heavily exposed to the strength and energy that comes from Louise (practically leaks out of her ears) as I've known her since I was I guess about 8 or so. Truly one of a kind. I guess that's why I wasn't at all surprised at what I saw when I decided to take a look into the eyes of the person she came from. Thank you all, and thank you Susie, for making me feel so welcome on such short notice. Thank you for making me feel like a total wimp on the phone when I was thanking god that you, at first, appeared to be giving me a pass on the jump. Well played. She will definitely live on. I think the beauty of the bucket List, whether intended or not, was the impact Susie had on all of our lives for the last few months and how it made us realize that family really does come first. It doesn't matter when or where you came into our lives but that YOU DID! IF you hadn't been" family "on that sky diving day we would have adopted you right on the spot. You gave us all another life lesson on courage that day. One thing I think we can say about Susie is that if nothing else, she died from complications of a life well lived. She showed us how to live and she taught us how to die. We are so blessed to have been able to spend time together and I believe we will be continuing these family trips to keep what we have gained. I know our children, Deirdre and Kyle have been so blessed to have such a wonderful relationship with their "Grandy" and Tom and I were fortunate to be living so close to her. We were able to spend a lot of time especially near the end with her. Hopefully we will see you again soon and get to meet those cute children and your lovely wife. I have been following your moms story and the adventures of your family, your strength and grace. I am from MD, and an employee of the Christopher and Dana Reeve Foundation. All the time I watched, I never knew the Reeve Foundation would be a recepient of your families generosity. I thank you for that gift to the Foundation. I know it will be used to help many others. I was saddened that today is the Mass as I am away on a business trip. I will be with your family in thought and prayer however. Thank you for the gift of this blog, for sharing your moms story and for taking me along on the journey with you. It has given me perspective on my life and how to live each day. Again, thank you for your generosity--of both spirit and of giving. Oldfields School sends its deepest condolences to the Weadock and Rowe families. 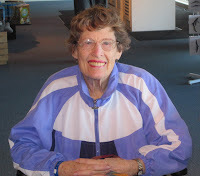 Susie Mann '48 will always be an Oldfields girl who dared to live life to its fullest. We are so proud to have called her an alumna.